Built 1802 using stone from Sulby Glen. A 120 ft bell tower linked to the church by an arch was added in 1869 but middle section was removed during WW2 by the Air Ministry in order to improve safety at the nearby airfield . Although money was allocated to rebuild it after the war, the parish decided it had more pressing demands to satisfy. 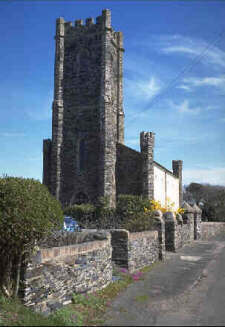 Built to a design of John Welch in 1839; Romanesque style with square tower. 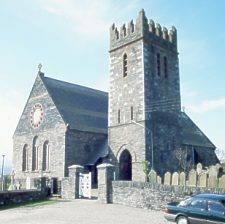 Built under of an Act of Tynwald by the Rev William Drury, who was first curate after its consecration on 25 Nov 1841. Sally McCambridge Andreas priv pub 2005 (available via shop at Manx Musem) is a history of the people of Andreas from about 1740 onwards - the missing 'name index' is available.